Marketers: millennials are the future (and the present). Not only will these young individuals soon be the ones comprising the majority of the workforce, running companies and managing the world, but they also currently wield roughly $1.3 trillion in annual buying power already (BCG). Additionally, the U.S. Bureau of Labor Statistics estimates that 50% of the American workforce will be millennials by 2020 (Lemonstand). Millennials are comprised of young adults ranging from soon-to-be college grads to early thirty-something year olds, and they have been active social media users since the dawn of MySpace. In fact, 87% of online adults between the ages of 18 to 29 in the US use Facebook, 53% use Instagram, 37% use Twitter and 34% are on Pinterest (Pew Research Center). Furthermore, more than 85% of millennials in the US own smartphones (Nielsen) and touch these smartphones more than 45 times a day (SDL). 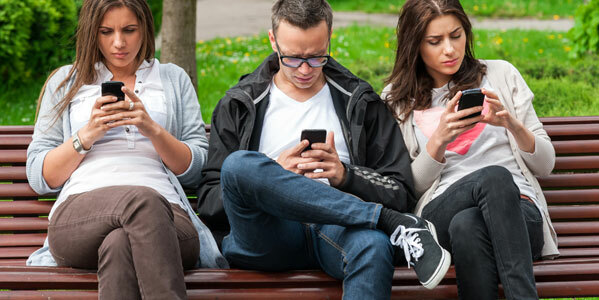 Evidently, these folks are mobile addicts and accustomed to the real-time, “right here, right now” nature of social media. What do these stats mean for companies trying to attract these consumers? According to a recent study, roughly 64% of respondents between the ages of 18 and 34 claim to use social login because they dislike spending the time to fill out registration forms (Gigya). Social login not only saves consumers’ time, but it also spares them from having to remember yet another username and password combination. Per the same survey and the same age criteria, nearly 45% of respondents said they use social login to avoid having to remember another username and password (Gigya). What’s more, enabling social login makes it significantly easier for potential customers trying to register on a company’s website while using mobile devices, a common occurrence for the average millennial as they spend so much time on their phones. A push of a button is quick and easy while typing out multiple fields on a touch screen gets annoying very quickly. Another characteristic of millennials worth noting is their collective tendency to shop online. 40% of male millennials and 33% of female millennials say that they’d love to buy everything online if they could, and almost half of all millennials spend more than an hour looking at retail sites daily (Lemonstand). Knowing that millennials enjoy shopping online, and spend a lot of time doing so, eCommerce sites should expect a lot of young consumers filling out online purchasing forms. But did you know that 60% of US and 64% of UK consumers have admitted to abandoning a purchase on a website or app because it required them to fill out a registration form (Gigya)? With social login, instead of having to manually input their info into a purchasing form they have seen a million times, millennials can click a single button and have all their purchasing and shipping information seamlessly and securely transferred from their PayPal and/or Amazon accounts — or any other site that stores purchasing information. Again, this use of social login speeds up the registration/checkout process, eases mobile registration and eliminates the need to remember another new username and password. For any brand trying to improve its appeal to the young consumer, it is important to provide personalized user experiences and relevant, targeted marketing. For instance, media publishing sites need to effectively personalize content recommendations, while travel sites must personalize itineraries and destination highlights. eCommerce sites should prioritize relevant product recommendations as well since 80% of consumers like when retailers’ emails contain recommended products based on previous purchases (InternetRetailer), and 45% of online shoppers are more likely to shop on a site that offers personalized recommendations (Invesp). First-party data, which is information provided directly by customers, is the key to providing this level of personalization. Marketers can gain access to this rich data quickly and easily with social login as users grant brands permission to pre-existing data stored within their existing social identities. This valuable data can then be utilized to create accurate user profiles, which is the key to building modern-day marketing strategies. 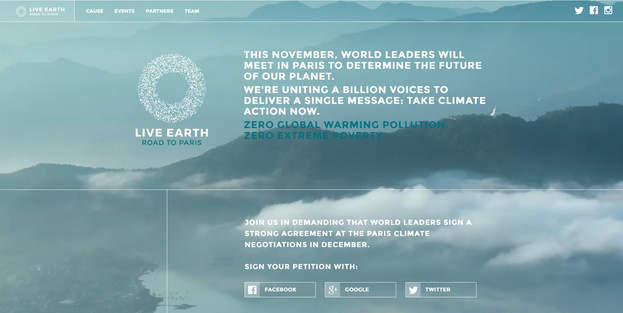 For example, when users log in socially to LiveEarth.org, the brand collects users’ locations with permission, and then leverages this information to send subscribers targeted email communications when the brand is hosting events in the users’ areas. 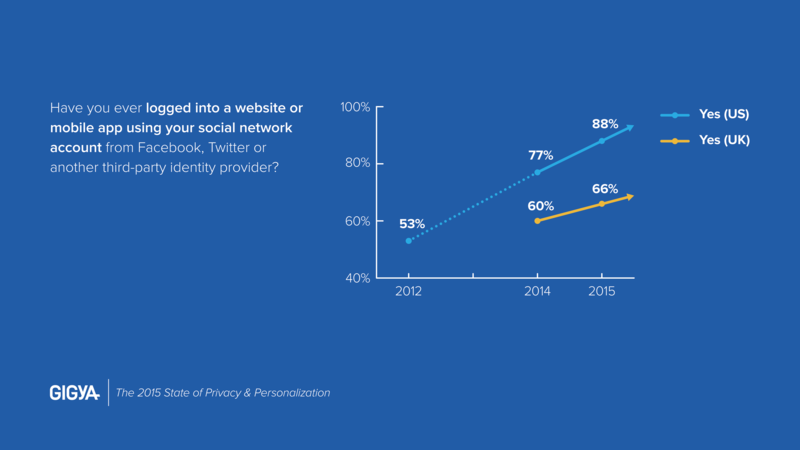 Gigya’s 2015 State of Consumer Privacy & Personalization report illustrates how young consumers use social login features for the convenience it provides. The survey shows that 94% of 18-24 year olds and 95% of 25-34 year olds have logged into a website or mobile application using an existing digital identity from a social network such as Facebook, Twitter or Google+. Overall, there was an 11% increase since our 2014 survey and a 35% boost since our 2012 survey in US consumers, regardless of age, who had used social login to access a mobile app or website. As millennials take over the consumer population, social login usage continues to increase. Imagine what the climate will be like in another five to ten years when millennials comprise the majority of the work force and the nation’s spending power — social login will be an absolute necessity to ensure high registration conversions.